New gift will help researchers study basic and applied science behind this pain-relieving approach. Gene Fridman and Yun Guan recently showed that application of direct electrical current can block the activity of pain-promoting neurons. For centuries, people have been applying stimuli aimed at nerves that don’t ferry pain signals to affect the function of those that do, an effect known as neuromodulation. It’s the concept behind transcutaneous electrical nerve stimulation (TENS) units or implanted spinal cord stimulators. And while many patients report that these interventions provide substantial relief, exactly how they work has been a mystery. A recent $3.5 million gift from the Theodore N. Lerner Family Foundation, establishing the Lerner Family Fund for Pain Research, will help researchers delve into the mechanisms behind this phenomenon—potentially leading to new ways to effectively apply this strategy to more patients. 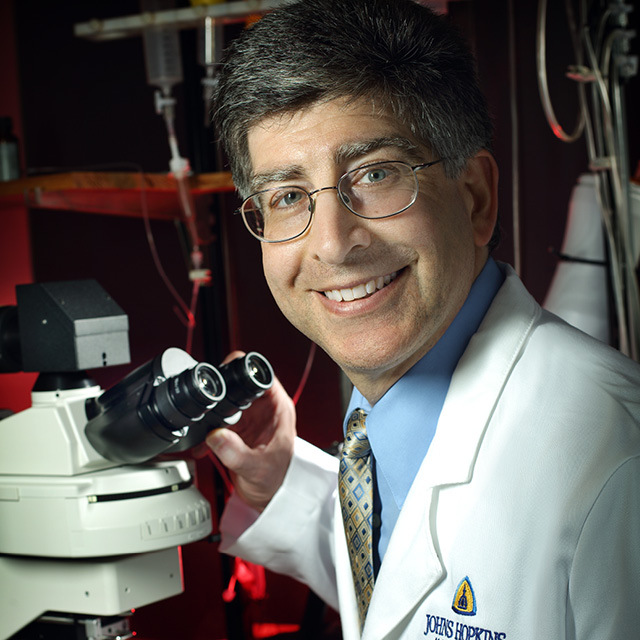 This endowed fund will be split between the Neurosurgery Pain Research Institute at Johns Hopkins and the laboratory of Thomas Smith, a specialist in palliative care at the Johns Hopkins Sidney Kimmel Comprehensive Cancer Center. 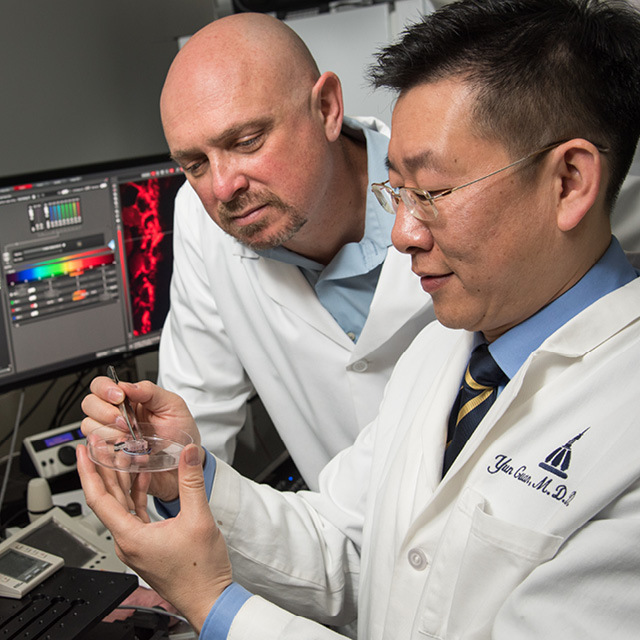 The institute is using much of its part of the gift to fund basic research in the lab of Yun Guan, a researcher in Johns Hopkins’ Departments of Anesthesiology and Critical Care Medicine and Neurosurgery and the institute’s Director of Pain Neuromodulation Research. Guan’s is working on developing animal models to study the fundamental mechanisms of neuromodulation at the cellular and molecular level. Developing an essential understanding of neuromodulation at the most basic level, explains Caterina, can help researchers make these pain-fighting modalities work better and longer for a broader swath of patients. This work is already paying dividends, he adds. In a recently published study, Guan, along with Gene Fridman in Johns Hopkins’ Departments of Biomedical Engineering and Electrical and Computer Engineering and their colleagues, showed that using direct current—rather than the alternating current of most neuromodulatory devices—disproportionately blocks the activity of neurons that promote pain, compared to those that quiet pain transmission. These findings could help researchers develop devices that target a range of different types of neurons or are tailored to specific types of pain. Guan and his colleagues are also using this gift to collaborate with Smith, much of whose work focuses on a patented approach called Scrambler or Calmare Therapy. This form of neuromodulation involves several electrodes being placed on different areas of the body with electrical signals running concurrently between them for a set time period—for example, 30-45 minutes a day for two weeks. The two labs are working together to better understand the basic mechanisms behind why this therapy is so successful for some patients when other interventions have failed. A subset of the gift will fund a fellow who will not only make contributions toward fundamental neuromodulation work in Guan’s lab, but also use this research to launch her or his own scientific career—an expansive use of these funds that will continue this important work in future generations of scientists, Caterina says. “Traditional funding sources tend to focus on additive research based on previously established research concepts. But truly novel exploratory ideas, like understanding neuromodulation for cancer-related pain, are less likely to receive funding,” says Henry Brem, director of Johns Hopkins’ Department of Neurosurgery.